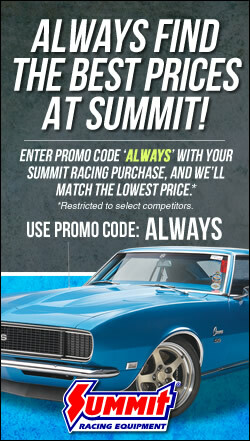 It’s time to hit the highway for a little summer adventure. Our getaways often include four-wheeling on new and distant trails, and that means towing our Jeep behind a motorhome or some other tow vehicle. When it comes to choosing a towing method, you’ve got a few choices: flatbed trailers ($2,500+), tow dollies ($1,000+), and tow bars ($125). Obviously, the prices are approximates, but close. Let’s look at the pros and cons of the three types of towing. 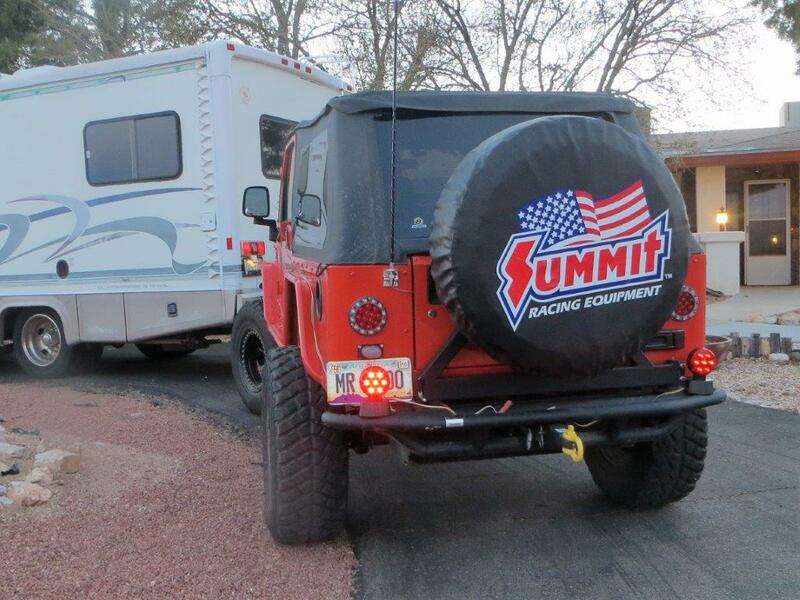 Trailers are considered the best way to transport your Jeep but they are also the most expensive. Tow dollies can be used if one of your axles cannot remain on the ground while the vehicle is being towed recreationally. Flat towing with a properly mounted tow bar is almost as safe as trailering your rig, and far superior to using a tow dolly. 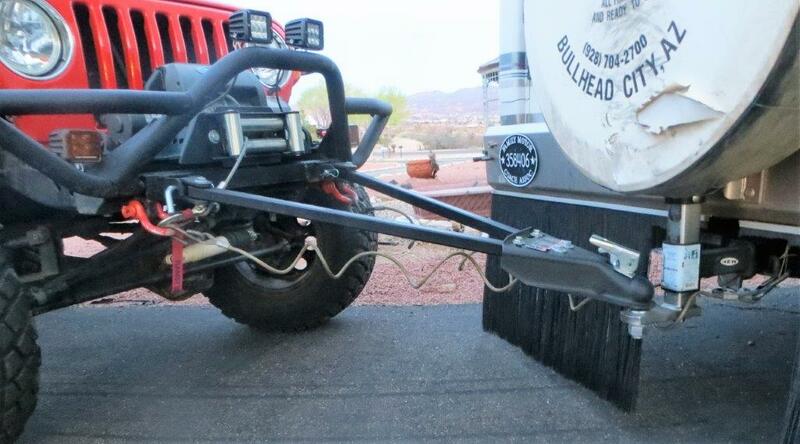 A Curt adjustable tow bar will allow you to tow up to 5,000 pounds. It is a black powdercoated steel tow bar with a 2-inch heavy-duty coupler, bolt-on bumper brackets, and mounting hardware. It is adjustable from 26 inches to 41 inches. Some vehicles—such as our Jeep—may require custom bracket fabrication. And many recent model Jeeps are factory-equipped with soft, collapsible bumpers to meet safety requirements. These Jeeps will need a base plate-type tow bar; however, all those Jeeps with aftermarket steel bumpers will accept this tow bar. In addition to the tow bar you’ll need a pair of safety cables. We chose a set of Curt safety cables that are designed to give maximum security and peace of mind when towing. These cables are self-coiling to keep them from dragging when towing. Each cable is coated for safety and to help prevent rusting and fraying. They are 42 inches in length with spring-loaded steel safety latches that keep the hooks in place. We use the D-rings in the Rugged Ridge tubular bumper on the Jeep side and the receiver’s attachment points on the motorhome side. 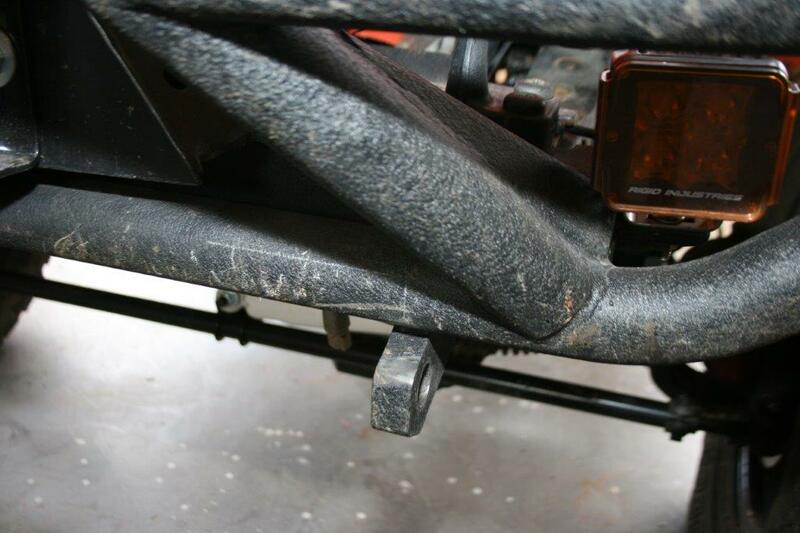 When attaching the safety cables, cross the cables beneath the tow bar. This does two things; they tend to support the tow bar should it become disconnected from the ball. 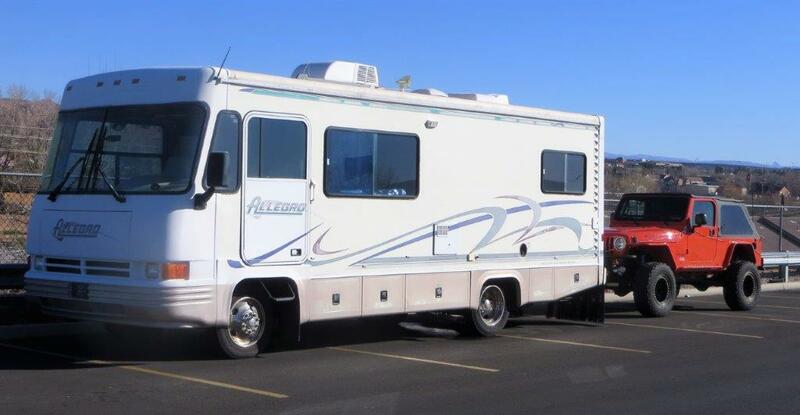 Secondly, it will control the Jeep better, keeping it behind the motorhome if the tow bar becomes disconnected. Without crossing the safety cables—attaching them in parallel—the Jeep will wander all over the place with a disconnected tow bar, plus the bar could very likely come into contact with the pavement at speed, which could flip the Jeep. One last thing is needed for flat towing: a set of taillights. You can use the Jeep’s own taillights for towing behind a pickup or motorhome if you know how to wire the trailer plugs and use diodes. Diodes are one-way circuit protectors that allow electrical power to flow in only one direction. In order to use brake lights as turn signals as well as brake lights, they must be separated by either diodes or a switch that breaks the circuit. If you use a switch, you could forget to reset it when driving the Jeep so diodes are safer, but require more electrical knowledge. Or…. You can use a set of magnetic taillights, which is what we did. A Grote Industries LED towing light kit is all inclusive with two magnetic lights, cable, and four-way connector. 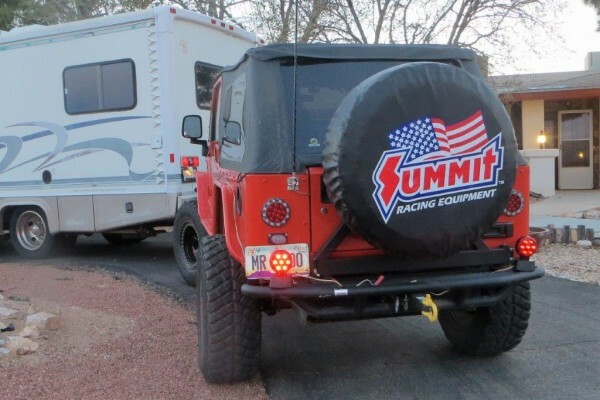 Simply plug them in—you’ll need an adapter to match any trailer electrical outlet other than a flat-four—route the cable to the rear of your Jeep, and allow the lights to lock themselves to the rear bumper with their magnetic stands, and you’re ready to roll. 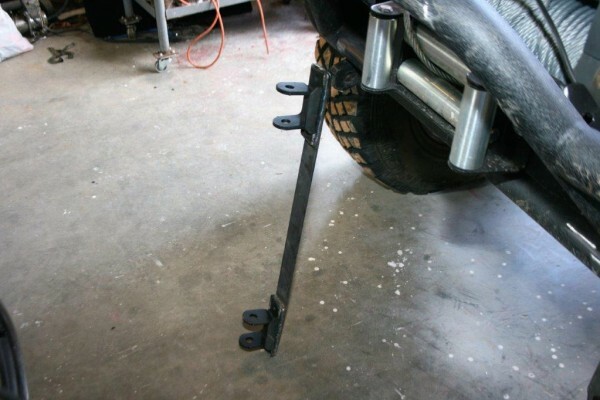 Work out a system for hooking up your Jeep. Do the same things in the same sequence every time after that, and don’t allow anyone to interrupt. Safety is upmost here and if you forget to perform one of the tasks because of being distracted, it could prove to be dangerous. 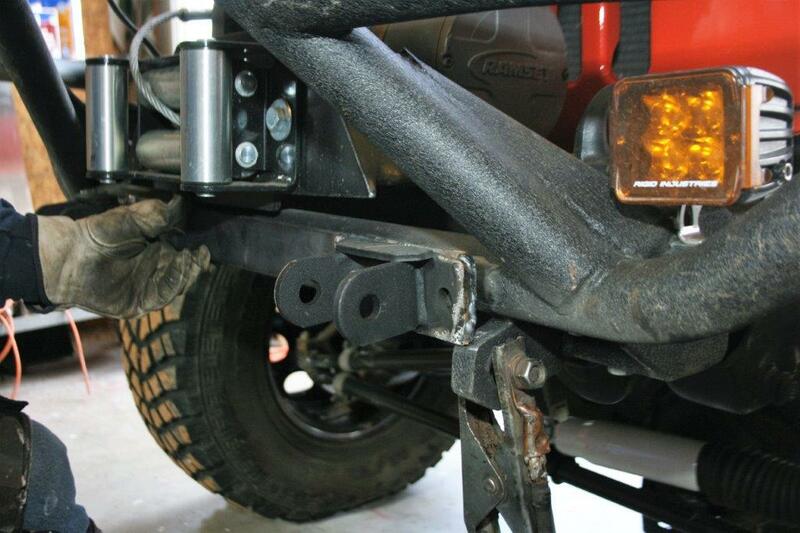 We had to modify the Rugged Ridge RRC tubular bumper for the tow bar’s mounting brackets. On some tow bars, the large D-ring mounts could be used but I prefer having D-rings in them. 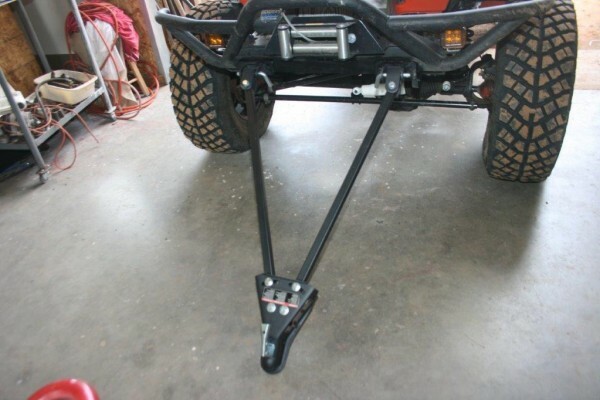 Two of these mounts come with the Curt tow bar to allow its movement up and down. 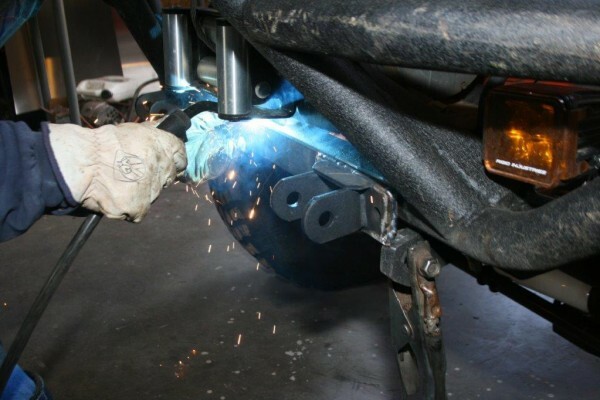 Rather than rely on the relatively small contact areas the backing plates provide on the RRC bumper, Kevin Lake welded them to a ¼-inch-thick strap. 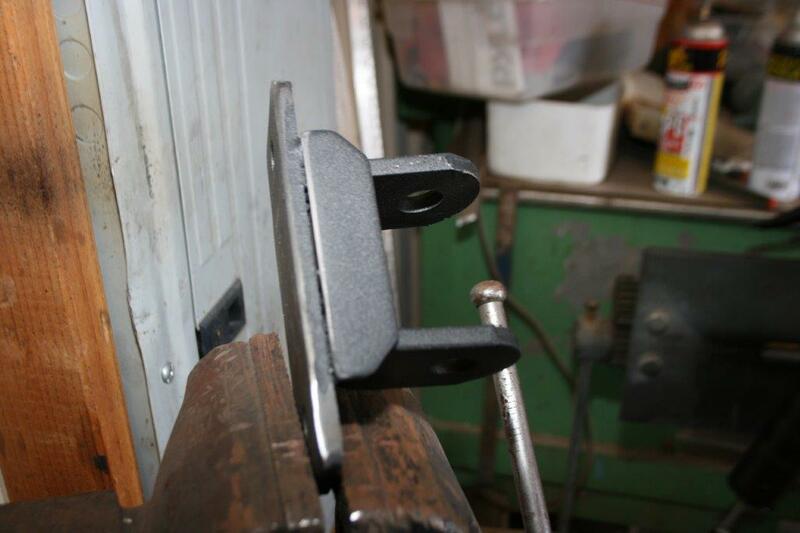 The thick steel strap provides a very secure mounting surface for the tow bar mounts. One last time to make sure the strap fits. 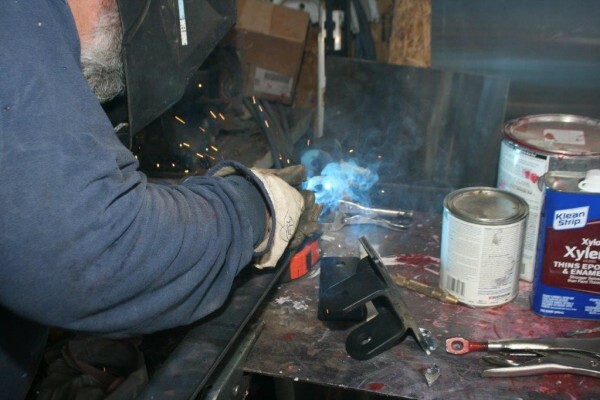 Also, we had to clean the powder coating off the RRC bumper so Kevin can weld the strap to the bumper. The strap also gives much larger contact surfaces for welding to the Rugged Ridge bumper, providing a much more secure tow bar mount. It’s mounted and ready to hook up. 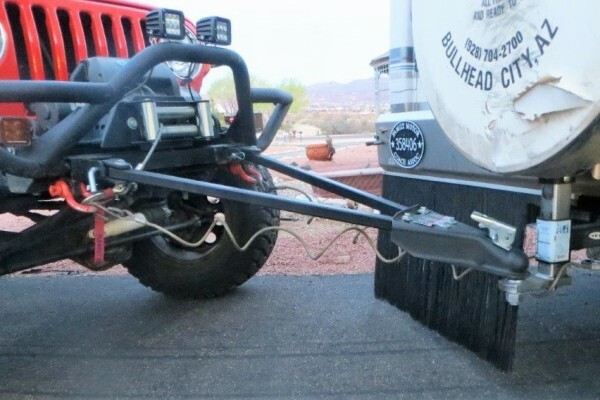 Some states no longer allow a tow bar to be mounted and secured upright while driving the Jeep on roads and highways, so I remove it for storage between trips. You’ll notice the safety cables are crossed beneath the tow bar. Some people like wrapping the cables around the tow bar arms but that adds weight to the tow bar and can be uncomfortable during attachment. 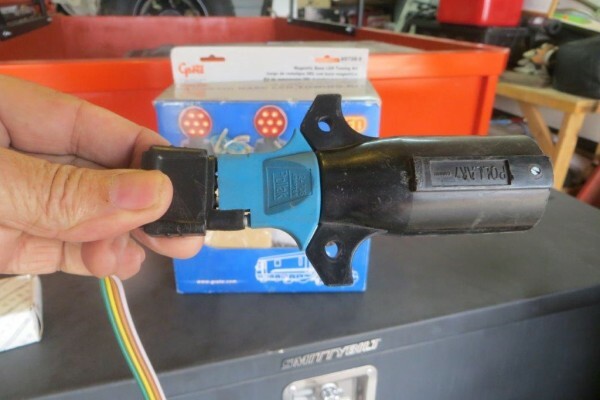 Although many pickups are now equipped with a combination trailer plug, because the towing lights come with the flat-four electrical plug, you may need an adapter to match the towing vehicle’s connector. 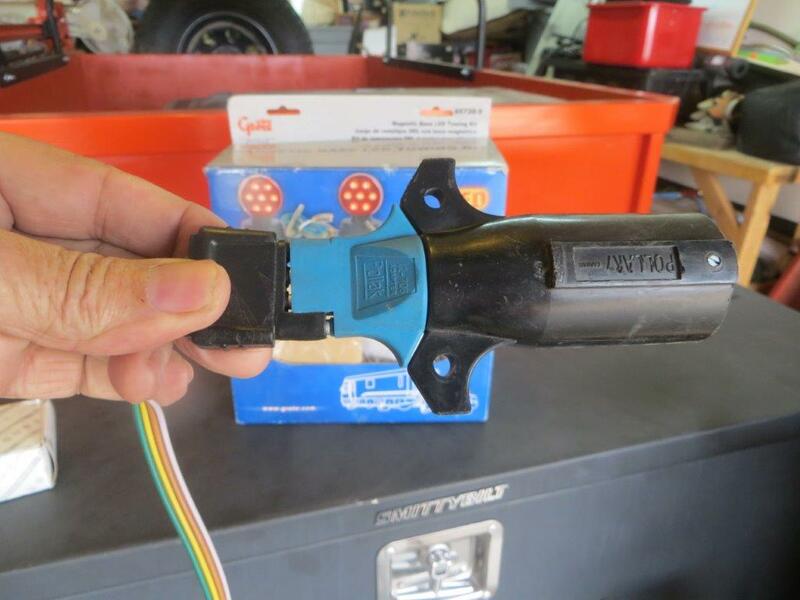 Adapters are available at most auto parts stores and all RV supply shops. The seven-LED taillights are highly visible, and their magnetic mounts are very strong and secure. Tow dollies can be backed up. Just have to be careful. 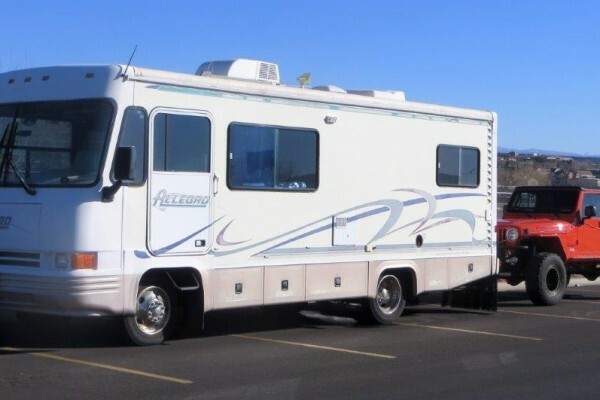 Towing bars are great for many of the reasons listed above. However, it is imperative that they be safely installed as accidents are known to occur. As a seller and installer of tow bars I recommend doing some research before you hire just anyone to take the job.